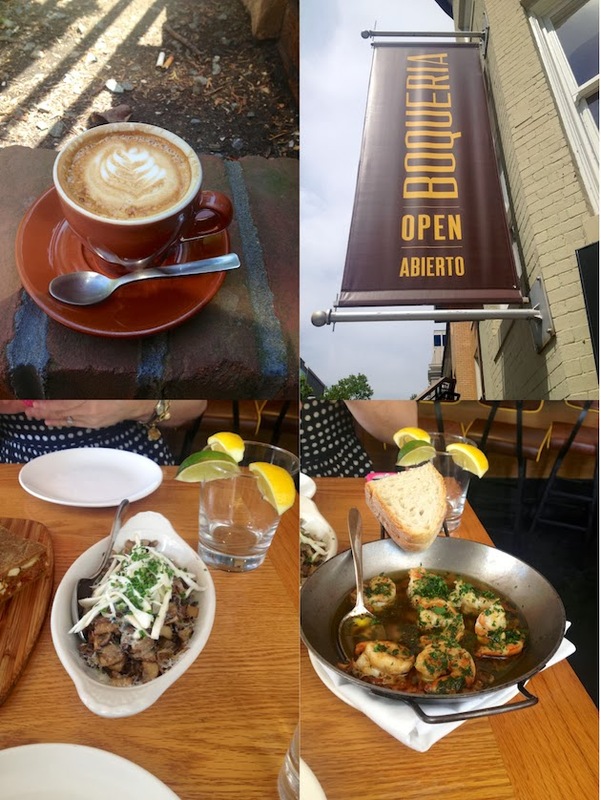 DC Eats & Food: My Lunches With Jeanne: Mini Food Crawl: Boqueria, Astro, GBD, Etc. Jeanne and I arrived in DC around 11am. Way too early for my taste to have lunch but the idea of fried chicken and doughnuts really appealed to Jeanne. Did I mention she is a skinny momma?! As I mentioned before, Jeanne loves everything pork too. I wonder why I chose her as my food wandering companion?! Go figure. She might have altogether chosen me for all I know, and here I thought I held the reins. Speaking of which, she is the one steering the wheel. Navigating DC like a pro, even after a decade long absence, living in San Diego. When it comes to fowl, Jeanne and I both share the love for fried chicken. Though did I mention?! For me it was still WAY too early. I still needed my second cup of coffee. 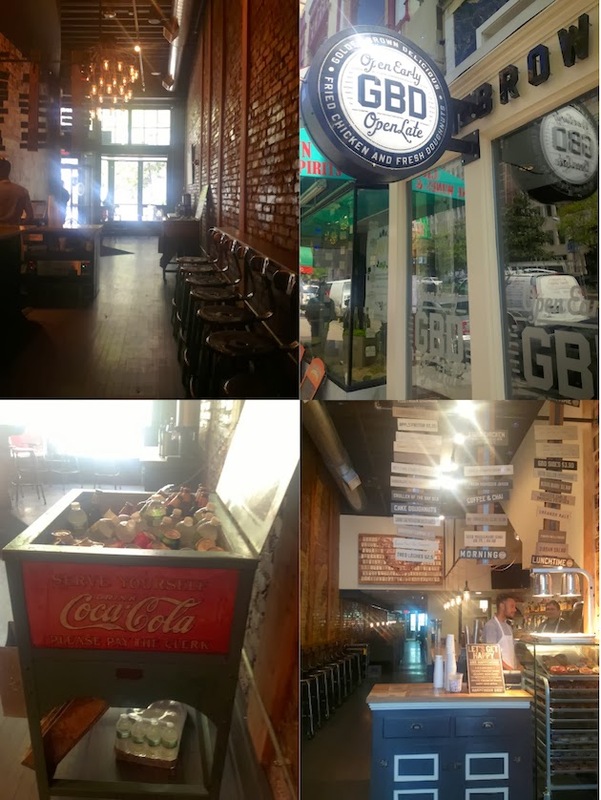 The light streaming into the long exposed brick walls corridor-like, GBD (Golden Brown Delicious) Fried Chicken and Fresh Doughnuts space, was playful, dotting inside the dark rich hued interior. We ordered and inconspicuously slid into a scarcely lit booth close to the kitchen. The fried chicken was perfection. Super flavorful. Crispy outside and beautifully moist inside. The biscuits were buttery, flaky deliciousness. That is coming from someone (me) who is relatively new to biscuit loving. Jeanne was missing the gravy which I offhandedly brushed off. I really do not like gravy that much, but talk to me in a couple of years I might come around on that one. The doughnuts are more brioche like, but I need to check the place out again to get a better feel for the doughnuts. Jeanne and I definitely would come back for fried chicken and biscuits again and there was even talk of bringing the families along. It was too dark in our booth, so the food photos came out spotty, but you just have to take my word for it. At long last I got my second cup of coffee that day at Filter. It's an urban neighborhood joint and the baristas seem to know what they are doing. The cappuccino looked like perfection if it wasn't for what I thought was a pigeon flying into my head, while we got situated at the outside patio table, way before the Polar Vortex. Little had I known that I would end up wearing the cappuccino, luckily only over my rain coat. From there we walked over to Glen's Garden Market. I was curious to check it out. We almost stepped into road kill en route which made Jeanne shriek. She was walking just ahead of me. Then we went out to lunch at Boqueria. When we were in NYC over Thanksgiving weekend, I was so tempted to visit the original Boqueria (s) there as well. That is how much I loved their DC outpost here in Dupont Circle. The food is spot on. Super delicious, great presentation and relaxed yet a cool vibe. Whomever's hand is with the flavorings, it's spot on, the right touch and balance. You can't go wrong with any dish on the menu. Great tapas for sharing. The sautéed wild mushrooms with Manchego cheese and thyme was phenomenal and I even tasted a bit of the shrimp, garlic, Guindilla pepper flooded with olive oil (shhh) which was equally sensational, and I don't usually touch shellfish. We will be back again. It feels like an effortless and fun outing that, as long as consistency stays the same, will never disappoint. 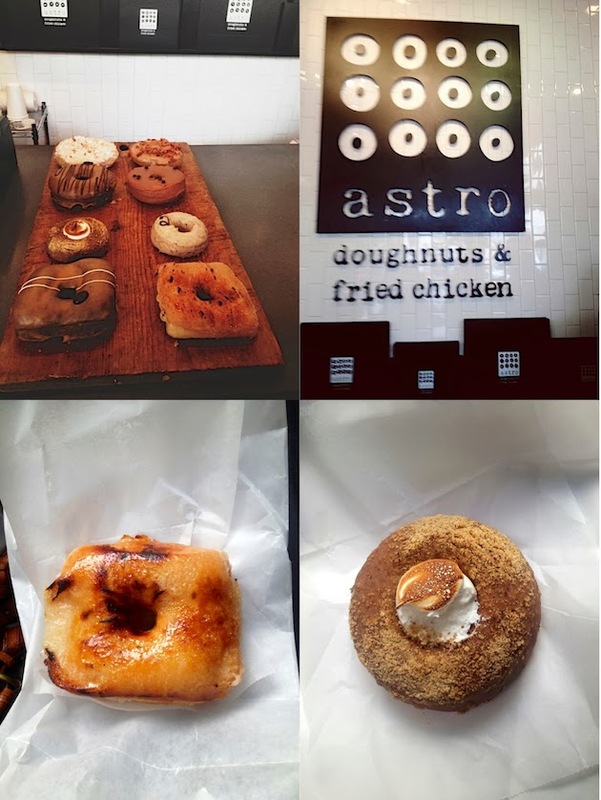 To cap off our food crawl, Jeanne and I went to, where else, but fried chicken and doughnuts at Astro Doughnuts and Fried Chicken, before heading back home. Hmm...was it on the same outing?! No wonder I am not shedding any lbs but I digress. I have written and praised Astro Doughnuts, particularly their creme brûlée doughnut, several times over, in the past, up and down social media. The creme brûlée also landed on my top three favorite doughnuts for 2013 , check out the other two. I don't care for cake doughnuts so when we realized that that is what we ordered initially to split, Jeanne and I went back for the fried ones. Jeanne liked the cake doughnuts. It was something s'mores, I believe. Good thing that we did, otherwise we wouldn't have discovered the prized one, my beloved creme brûlée. Seriously, I am not being overly dramatic (well maybe a tad), but yep, it's a DC must. I've got to go back and try the fried chicken again. It was good but I think the creme brûlée doughnut's brilliance overshadowed the poor fried chicken. I bet I would love all the fried doughnuts at Astro as the master dough is the same, I gather. I've been back on several occasions for the creme brûlée. I am looking forward to my next food crawl with Jeanne this week. It's been too long. You can follow it live on Instagram, Facebook and Twitter, so follow, like and stay tuned! The photos in this post were taken on my iPhone. There were some inconsistencies on subsequent visits to DGS Delicatessen. I wish for leaner cuts of pastrami there. They are were way too fatty on my last visits. My guys and my son's friends liked it regardless. I love the storytelling in your posts, Shulie. Thanks for sharing. Absolutely love food crawls! What a great time! I was to go on a food crawl with you! I want that creme brûlée doughnut like right now!